Older Person: You need to do well in school. Older Person: Because you need good grades to get into college. You: Why do I want to go to college? Older Person: Because you need a college education to get a good job. That put things in pretty practical terms. The older person probably didn't talk about a love of learning or some refined sensibility that comes from higher education. Instead, you were encouraged to view college as a ladder, a route toward a better life. When people talk about the American Dream, they often envision something better for the next generation: a more comfortable, secure life made possible by more education. This perspective focuses on what education can do for individuals; it is individualistic. But it is also possible to adopt a loftier viewpoint, to consider what higher education does for an entire nation or society. From this perspective, when more people get more education, we're all better off: we increase our stock of human capital or human resources. Thus when public policy wonks talk about workforce quality, they define it simply in terms of average education. If Country A's people have, on average, one more year of schooling than Country B's population, then Country A is considered to have a higher-quality workforce. A more educated population means more knowledge, more skills, more people who can do more to make things better for all of us. This is a broader communal perspective, in that it sees education as benefiting the larger community. These individualistic and communal perspectives coexist. When parents encourage their kid to do well in school, they are thinking of a college education as something that will be good for their particular child. But imparting individual aspirations to lots of young people results in a communal benefit. The more educated a population, the more productive and prosperous its citizenry. More education reduces all sorts of social problems: on average, educated people live longer, are healthier, have more stable families, are less likely to get into trouble with the law, and so on. More education benefits individuals at the same time that it benefits the community.1 It is a win-win. This is why governments invest in education. In colonial America, schooling was a private, individualistic affair; if you wanted your child taught, you paid the schoolmaster for the lessons, all the way through college (Harvard and other early colleges were all private institutions). But as the United States emerged as a great nation, the state and federal governments began supporting education. States passed laws requiring minimal levels of universal education, and communities made that possible by building schools; while you could choose to have your child taught at a private or parochial school, publicly funded schools were available for all children. Over time, states raised their minimum standards for completing schooling. A century ago, many states required only an eighth-grade education; today, most states require that students stay in school until they turn sixteen or seventeen. The logic behind these requirements is that the state benefits if all its citizens are educated. And to ensure that they had enough teachers to teach all those children, as well as enough people trained for engineering and other needed professions, states established their own public colleges and universities. The federal government also threw its support behind higher education. For instance, the 1862 Morrill Act gave each state federal land to be used to establish a land-grant college that would promote scientific agriculture and engineering. This policy was inspired by a communal vision: by supporting higher education, the federal government would foster a trained workforce that would make farming and industry more productive and, in the process, strengthen the nation. Similarly, at the end of World War II, the GI Bill provided a variety of benefits for returning veterans, including support for those who wanted to attend college. The law was intended to ward off the sorts of protests by angry veterans that had followed World War I, but it also had the communal effect of boosting the nation's stock of human capital. In other words, Americans have long understood that higher education is a good thing, which brings both individualistic and communal benefits. Parents believe that their children will have brighter prospects if they go to college, even as policymakers understand that a more highly educated population is key to the nation's strength and prosperity. We accept that higher education is important, something that people should want for themselves and for others. Going to college seems interwoven with widely shared, important ideals about equality, opportunity, progress, and the American Dream. There is general agreement: people who aspire to attend college deserve encouragement and assistance. Like the Morrill Act and the GI Bill, federal student loan policies began as a response to Americans' general approval and endorsement of higher education. This chapter describes the evolution of these policies through 1972, when President Richard Nixon signed legislation establishing the Student Loan Marketing Association (better known as Sallie Mae). It examines the rising demand for higher education and the recognition that college costs posed a key obstacle for many prospective students, and it also describes how specific, federally funded student loan policies emerged to meet these concerns. In addition, it argues that these policies reflected a growing acceptance of credit as a routine, nontroubling feature in the lives of middle- and working-class Americans. 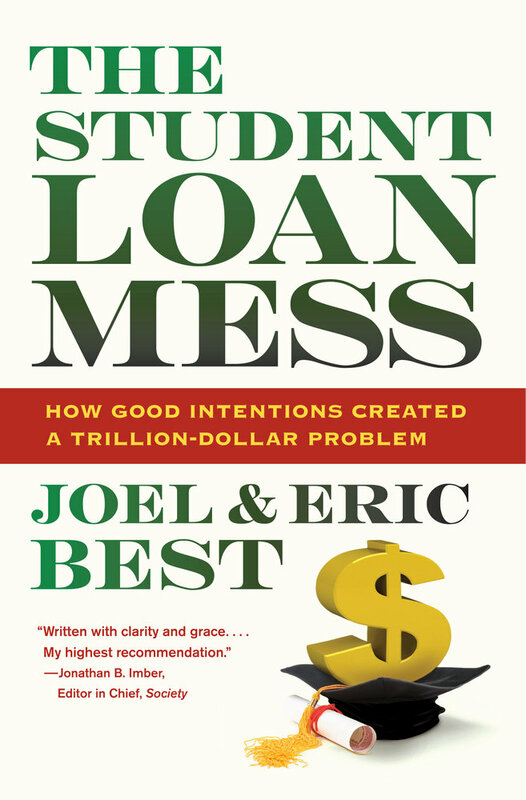 It is a story of the ideals, aspirations, and well-intentioned policies that produced the initial student loan mess. But understanding that story requires that we begin by appreciating the dramatic rise in the proportion of Americans seeking higher education during the twentieth century. By the end of the twentieth century, attending and completing college had become far more common, not only among white men but also among women and African Americans. We can see this in figure 2, which covers the period 1940-2010 and shows the percentages of people twenty-five to twenty-nine years old with at least four years of college-which we'll treat as equivalent to graduating from college. We've chosen to examine the age group twenty-five to twenty-nine, rather than everyone over twenty-five, because the latter category includes older people (who were much less likely to attend college back in the day). Although some people graduate from college after leaving their twenties, most complete college by age twenty-five, so using the twenty-five to twenty-nine age category tracks the trend in how much education people have early in their adult careers, at a time in life when most people who are going to complete college have done so. Of course, demonstrating that a growing proportion of young people are completing college is not all that surprising. After all, young Americans have long been encouraged to pursue higher education for both its individualistic and its communal benefits. But note that figure 2 reveals other, less obvious information. Through 1980, white men maintained their historical lead as the group with the highest percentage of college graduates. But in 1990 white women caught up, and by 2000 they had taken what would become a commanding lead. In 2010, 36.9 percent of white women had completed college, versus only 28.8 percent of white men; the 8.1 percent gap between the two groups was actually greater than it had been at any time when graduation rates for white men were ahead of those for white women. Figure 2 also shows that the college completion rates for African American men and women stayed fairly close through 2000, but in 2010 a large gap appeared, as the percentage of black women completing college continued rising, while the percentage for black men actually fell. Figure 3 presents comparable information for two other ethnic groups, Hispanics and Asians. The government only began publishing records for these two groups more recently, but figure 3 demonstrates that there are dramatic differences between them. Asians have a much higher proportion of college graduates than the other three ethnic groups; in both 2000 and 2010, more than half of Asians ages twenty-five to twenty-nine-both men and women-completed college. In contrast, Hispanics had the lowest proportion of college graduates. And in both ethnic groups, a higher percentage of women completed college. Although we have been focusing on college graduation, essentially the same patterns can be found at all levels of higher education. Not everyone who begins some sort of post-high school education completes a four-year degree program; some enroll in trade schools or community colleges, while others start college but drop out. But the percentages of people on all these paths have risen in the same way as the percentage of those completing college has increased. Similarly, growing percentages of people continue beyond college graduation to graduate and professional programs. Encouraged to pursue higher education for both its individualistic and its communal benefits, more people continue their schooling. These aspirations motivate segments of the population formerly blocked from higher education. Women, once a small minority of college students, now outnumber men on most campuses. Ethnic and religious minorities that used to find it difficult to gain admission to many institutions are now attending college in far greater numbers. Increasingly, colleges welcome students who are disabled, and a growing share of these are classified as having learning disabilities; people who once might have had great difficulty completing the work required in college classes now receive accommodations designed to create an educational environment where they can succeed. The spread of higher education reflects the growing participation of not only more people but a broader range of people. This democratization of higher education is now widely celebrated. Only two generations ago, a minority of young people graduated from high school, and only a fraction of those went on to complete college. But we understand that higher education is the principal ladder for personal advancement in today's world. For inequalities of gender, ethnicity, and class to shrink, categories of children who traditionally found it difficult to attend college need to be encouraged to continue their educations. Americans agree that higher education is good for all individuals and that it will improve their life chances, even as it is good for society, which should experience fewer social problems as educational attainment rises. These assumptions lead to calls for policies that will promote ever more access to higher education. Generations of aspiring college students and their families have faced a basic challenge: going to college costs a lot of money. There are tuition and fees-charges colleges levy for the services they provide. Students must also expect to pay directly related costs: the price of textbooks and other supplies. And there are the costs of the student's food and shelter. Students living in on-campus dormitories must pay dorm fees; even students who are able to live at home with their parents may have commuting expenses. Finally, there are opportunity costs, as students forgo whatever additional income they might have earned had they chosen not to attend college. The tremendous growth in higher education depicted in figure 2 began in the aftermath of World War II. The flood of applicants led many political and educational leaders to announce that higher education was facing a funding crisis: how could colleges cover the costs of educating far more students and offering a broader range of programs without charging higher tuition that would push higher education even farther beyond the reach of many? Many colleges offered to let students borrow a portion of the money they would need; that is, student loans were administered by the individual colleges. However, students used only a fraction of the funds that colleges made available for loans. Students-and their parents-shared a "widespread belief that to borrow money for college is to mortgage the borrower's future." During the 1950s, popular magazine articles chided "middle-income Americans, a get-now-pay-later breed when it comes to the iceboxes and TV" for "still clinging tightly to the pay-as-you-go idea on college education." Higher education, the articles insisted, was a sound investment: "A college education actually provides the increased income that more than pays for itself," while "college is a far better investment than a car, and borrowing to pay for college entails a smaller commitment than is usually involved in a mortgage." To be sure, not all students had equally bright financial prospects: "If you are headed for a comparatively low income field such as teaching or the ministry, you will probably want to borrow only as a last resort." Female students, in particular, were said to worry that "a debt would serve as a negative dowry": "They figure their chances of marriage are a lot better if they are financially chaste. [But] the more tolerant attitudes toward young working wives increase their chances of being able to pay off their debts even after marriage. "8 These articles encouraged families to accept the idea of borrowing for college. In the aftermath of World War II, it was clear that the nation faced a dilemma: the demand for higher education was growing, and there was general agreement that society needed more highly educated people; yet the costs of college blocked many people from achieving their aspirations, and there was considerable skepticism about the federal government's ability to offer a solution. So how did student loans emerge from this confusion as the principal means by which the federal government supported higher education? The story of how the United States arrived at federal student loans is one of those convoluted tales that often characterize histories of policymaking. These tend to be accounts of long series of negotiations, as different actors struggle to get their interests recognized and incorporated into whatever policy emerges. Rather than try to detail the ins and outs of every effort to shape federal support for higher education loans, we have chosen to highlight four early policies, beginning with one that supported college education without relying on loans. The Servicemen's Readjustment Act of 1944, familiarly known as the GI Bill, was designed to forestall the sorts of protests that angry veterans had mounted following the First World War. World War II had mobilized far more men and women, who had been away for a longer period of time. The nation needed to reintegrate millions of veterans into American society and its economy, and the GI Bill offered a range of benefits, including loans to help them purchase homes, farms, and businesses, and payments-not loans-for education. Although the GI Bill is recalled fondly as a policy triumph, it was the subject of considerable debate when the law was being crafted.10 Education was by no means the bill's central focus; rather, the principal concern was to award veterans "mustering out" pay ($500 in cash, the equivalent of about $6,450 in 2013 dollars) intended to help support them until they could find employment. The initial proposals for the new law featured limited support for higher education: only those veterans who had interrupted their college educations to serve in the military would receive aid for education. However, negotiations expanded the scope of the education benefits. By the time the GI Bill passed, it offered far more generous provisions: all veterans would be eligible for support if they chose to further their educations. The government would pay educational costs (tuition and fees, books, room and board) directly to colleges, and veterans would receive an allowance (initially $65 per month for unmarried veterans-that amount would be increased-plus additional sums for dependents). Nonetheless, people worried. Colleges weren't sure that the veterans would be able or willing to do college work. Conservative legislators opposed a government program that would boost the life chances for some individuals but not others. The bill's proponents overcame the opposition, partly because it was easy to argue that veterans deserved generous benefits to repay them for their wartime service, and partly because even the most optimistic projections wildly underestimated the number of veterans who would choose to take advantage of the educational provisions. These advocates warned that Americans were squandering a precious resource-the brainpower of its talented youth-at a time when it was most needed: "As a nation, the United States can ill afford the waste of man- and woman-power that occurs when children with the best brains are not educated to perform their optimum function. It is a well-documented fact that between 100,000 and 200,000 high school pupils in the top quarter of their class fail to go to college primarily because they lack the necessary funds. "14 Proponents seemed to agree on the size of the problem-200,000-although the meaning of that number seemed to shift. The Office of Education estimated that "over 200,000 students would be aided by loans" over a four-year period, while the New York Times spoke of "the 200,000 able students who drop out of school each year. "15 In any case, the Cold War demanded that America stop wasting its brainpower. This concern launched the first student loan mess. Title II of the NDEA created the first large federal student loan program for higher education. Funds for lending were made available to colleges (which had to match one dollar for every nine dollars provided by the federal government). Colleges were to give special consideration to "(A) students with a superior academic background who express a desire to teach in elementary or secondary schools, and (B) students whose academic background indicates a superior capacity or preparation in science, mathematics, engineering, or a modern foreign language. "17 Individuals could borrow up to $1,000 per year, to a maximum of $5,000; those who went on to teach full-time in public schools could have up to half the loan (and the interest on that portion) cancelled. It was a relatively straightforward program (see figure 5). But such critics were swimming against the tide. As the lead for another Times article put it, "Joe College is about to receive a lesson in practical economics. He soon will be picking up the tab for his own education, experts predict, simply because nobody else can afford to pay for it. "21 As the share of young people hoping to attend college rose, colleges were becoming less exclusive and more students were from families of modest means. Demand far outstripped the money available for scholarships, and many politicians resisted having the federal government simply give money to students. Yet the Cold War and the threat posed by Sputnik seemed to require policies that would foster scientific and engineering education. Why not encourage those students studying for essential careers, but by lending-not giving-them the money needed for college? The NDEA led to a boom in student borrowing: "In 1957, the year before the passage of the NDEA, 80,000 students borrowed money from college student-loan funds; in 1961, 115,000 students borrowed four times that amount thanks to the infusion of NDEA money. "22 And as demand proved greater than the amounts budgeted, Congress increased the funds available for loans (see figure 6). Federally supported student loans were becoming an increasingly important way for students to pay for college. It is less clear that the NDEA transformed the face of higher education.23 The proportion of high school graduates who became full-time college students did not change markedly (suggesting that the NDEA did not lead large numbers of low-income students to enter college). The proportion of teachers who had completed college did rise, but it is uncertain what proportion of those teachers relied on NDEA loans to pay for their training. Similarly, the number of degrees awarded in the sciences rose, but the degree to which the NDEA can be credited for this is unclear. The Cold War had provided the initial justification for a federal student loan program, and the NDEA's mandate was being expanded to benefit more students and more institutions. In the process, the federal government had now become committed to providing student loans, which set the stage for less restrictive policies. He went on to acknowledge that there would also be communal benefits: "This Nation can never make a wiser or a more profitable investment anywhere. In the next school year alone, 140,000 young men and women will be enrolled in college who, but for the provisions of this bill, would have never gone past high school. We will reap the rewards of their wiser citizenship and their greater productivity for decades to come." However, LBJ's lengthy statement made no mention of the Cold War or national defense. The original rationale for federal student loans had vanished in the few years since 1958, when the NDEA passed. At first glance, the HEA seemed to promise to cost the government less than the NDEA. Instead of putting up the entire loan amount, the government would be on the hook only for the interest. But there were two problems with this vision. First, the program's initial low cost was deceptive: "In a modestly growing interest-subsidy program of the [HEA] type, early years involve very small interest charges. But as the volume of outstanding loans grows, so do the interest costs. "27 And the volume of loans was sure to rise. After all, students who took out loans for their first year of college were also likely to take out additional loans during the next three years, even as new students were starting college and borrowing for their educations, so the number of students with loans, the amounts being borrowed, and the amount of interest being covered by the federal government were all sure to increase. And the number of young people entering college was increasing, both because a growing percentage aspired to go to college and because the large cohorts of baby boomers were now of college age. In addition, the loans would be larger, as college costs continued upward. There was every reason to anticipate that the program would grow each year, and that costs would balloon far beyond the $15 million budgeted for 1965. But the student loan program became particularly important because it offered federal aid to the middle class. In 1968, the New York Times Sunday Magazine carried a long article, "The Higher Cost of Higher Education," which argued that paying for college was becoming a "massive social problem." "Higher education is becoming less a privilege for the wealthy and more a right for everyone," the Times argued, so that "the broad middle class clamors at the university's gates. "31 The article's focus was middle-class families who were being squeezed between their inadequate savings and constantly rising college costs, with particular attention to the plight of parents with two or more children attending college simultaneously. Increasingly, these families needed student loans. The article quoted one lender: "Years ago, people resisted the idea of financing their children's educations with monthly payments, but when the Government got into the educational loan business it took the stigma away." The article went on to describe the HEA as "a guaranteed-loan plan aimed at middle-income and upper-income families, who have not been inarticulate in conveying to lawmakers their chagrin about mounting college costs." The notion that, in a mere seven years, HEA loans had grown to seventeen times the program's initial size did not seem to give Nixon pause. As figure 8 demonstrates, the growth in federal support for student loans had been impressive. The graph includes the initial years of both the earlier NDEA program and the later HEA loan programs (NDEA continued, but it was renamed National Direct Student Loans and directed at graduate and professional students). The rapid expansion in federal support for student loans-which, in retrospect, might seem to be the program's key feature-was noticed, but it mostly drew praise. These programs allowed significantly more students to borrow significantly more money. Most commentators saw this as the solution to the first student loan mess, which revolved around the problem of insufficient opportunity. Deserving young people needed help to fulfill their educational aspirations, and student loans provided that help. PAYE proposals attracted some media coverage, but they did not inspire federal policymakers. Presumably, it would have been difficult to gain support for the plan, both because it would have led to people with higher incomes paying back much more than they borrowed even as those with lower incomes might never fully repay their loans, and because repayments in the form of higher taxes would continue for thirty years-or longer. In theory, PAYE offered substantial long-term communal benefits; in future years, the additional tax revenues might be sufficient to cover the cost of loans to successive generations of new students. However, individuals might balk at agreeing to pay a lifetime of higher taxes, especially because college costs could be expected to rise. It was one thing to envision a $5,000 loan resulting in an additional 2 percent tax on income, but a student who borrowed $25,000-an unimaginable amount in 1970, but one that would soon seem less far-fetched-would be expected to cough up additional taxes equal to 10 percent of personal income to cover loan costs. Instead, policymakers' attention focused on a more immediate problem: the frequent need to adjust federal payments to make student loans attractive to lenders. Whenever interest rates rose, Congress was under pressure to quickly pass legislation authorizing higher payments, and those bills could be derailed whenever opponents tied them to other issues, such as refusing loans to student radicals. Moreover, lenders disliked student loans because they lacked liquidity-it might be several years before students who borrowed money to support their first year of college began to repay their loans. Proponents began to call for the establishment of a secondary market. There was now an arrangement whereby more students could borrow more money with less uncertainty. The first student loan mess seemed to have been resolved; prospects seemed bright. By 1972, federal student loans, which had been relatively rare only ten years earlier, were far more common. More students, many of them from families of modest means, aspired to higher education, even as college costs were rising; the marketplace featured more people-increasingly people with less money-demanding something that was becoming more and more expensive. No wonder student loans seemed to offer a solution. It was a solution with broad support: both LBJ and Richard Nixon called for expanding student loan programs. It is important to place these developments in their larger cultural context. The 1960s saw Americans becoming more comfortable with the idea of borrowing. To be sure, most people already accepted the notion that they would probably need to borrow to buy their homes, their cars, and often their major appliances. But those loans were against tangible assets; if someone failed to make their payments, the bank could foreclose, seize the house or car, and resell it. Loans were considered appropriate for big-ticket items; it would take too long to save enough to pay for a house. But there was a widespread sense that people shouldn't borrow to pay for most other items, which explains those 1950s magazine articles insisting that it was appropriate to borrow to pay for college and offering reassurance that education was a good investment because the increased income college graduates earned would more than pay for the cost of any student loans. For many people, this was-as the advertising campaigns for the cards proclaimed-a convenience. There was no need to carry cash; you could simply whip out a credit card when you wanted to buy something and pay off the balance when the bill arrived. But, of course, the lenders were quite pleased if you chose to carry a balance, paying just part of what you owed, because next month's bill would include an interest charge on the amount you still owed. This became the new normal: it was not uncommon to owe money on your house via a mortgage, on the car you'd purchased on payments, and on last month's purchases tallied in your credit card statement. So it didn't seem all that odd to take out a loan to help pay for college. After 1970, magazine articles stopped trying to convince readers that student loans made sense; they simply assumed people understood that. And so, we have the first student loan mess, a product of individuals' aspirations to improve their prospects-and their leaders' designs to strengthen the nation's human capital-through higher education. At the individualistic level, more young people wanted more education, even as that education was becoming more expensive. Meanwhile, politicians acknowledged the communal value of increasing levels of education, and they created student loan programs to give those young people the opportunities they deserved. The first student loan mess, based on concerns that the cost of college discouraged promising students and wasted the nation's brainpower, would be resolved through the federal government's support of student loans. But attention was already shifting to another mess. This illuminating investigation uncovers the full dimensions of the student loan disaster. A father and son team—one a best-selling sociologist, the other a former banker and current quantitative researcher—probes how we’ve reached the point at which student loan debt—now exceeding $1 trillion and predicted to reach $2 trillion by 2020—threatens to become the sequel to the mortgage meltdown. In spite of their good intentions, Americans have allowed concerns about deadbeat students, crushing debt, exploitative for-profit colleges, and changing attitudes about the purpose of college education to blind them to a growing crisis. With college costs climbing faster than the cost of living, how can access to higher education remain a central part of the American dream? With more than half of college students carrying an average debt of $27,000 at graduation, what are the prospects for young adults in the current economy? Examining how we’ve arrived at and how we might extricate ourselves from this grave social problem, The Student Loan Mess is a must-read for everyone concerned about the future of American education. • Student loan debt is rising by more than $100 billion every year. • Among recent college students who are supposed to be repaying their loans, more than a third are delinquent. • Because student loans cannot be discharged through bankruptcy, the federal government misleadingly treats student loan debt as a government asset. • Higher default rates, spiraling college costs, and proposals for more generous terms for student borrowers make it increasingly likely that student loan policies will eventually cost taxpayers hundreds of billions of dollars. Joel Best is Professor of Sociology and Criminal Justice at the University of Delaware and author of Damned Lies and Statistics, Stat-Spotting, and Everyone’s a Winner, all from UC Press. Eric Best is Assistant Professor of Emergency Management at Jacksonville State University.